Description "I call this dish a 'Treatzza' because it's a pizza dough with berries and fruit toppings and a banana sauce. It's a healthy treat that everyone will like and you can eat it breakfast or dessert!" 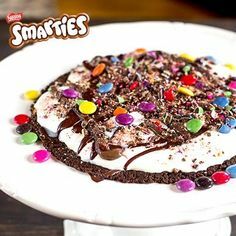 This Deep Dish Smarties Treatzza Pizza is drizzled with chocolate & perfect for that next summer party - if you don't eat it all in one sitting first! Similar recipes. Also see other recipes similar to the recipe for frozen pizza crust recipe. 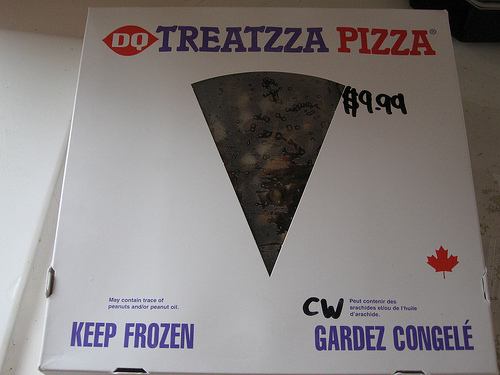 But DQ seems more than ready to make up for the lost time, adding a few new toppings to the Treatzza Pizza menu. Right now, Dairy Queen’s website lists Reese’s cups, M&Ms, choco brownie, and Heath bar as the different flavor options.